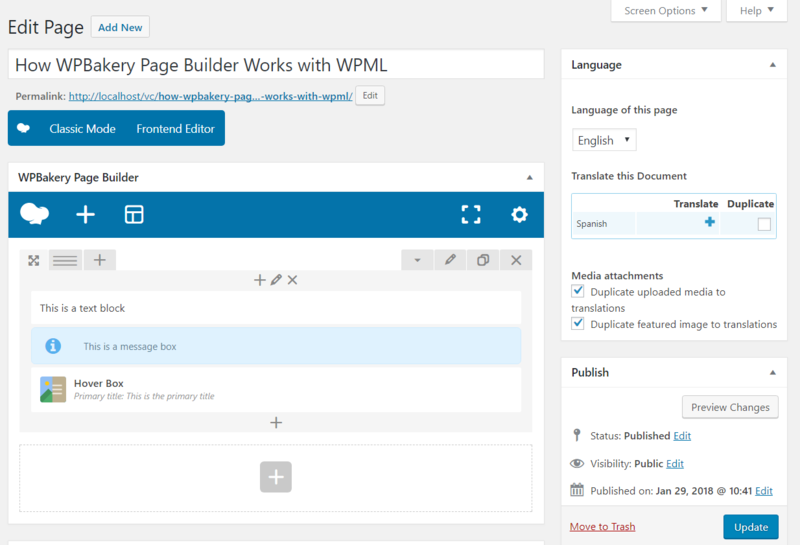 To understand how the WPBakery Page builder works with WPML, let us start by creating a simple page using the WPBakery Page builder. 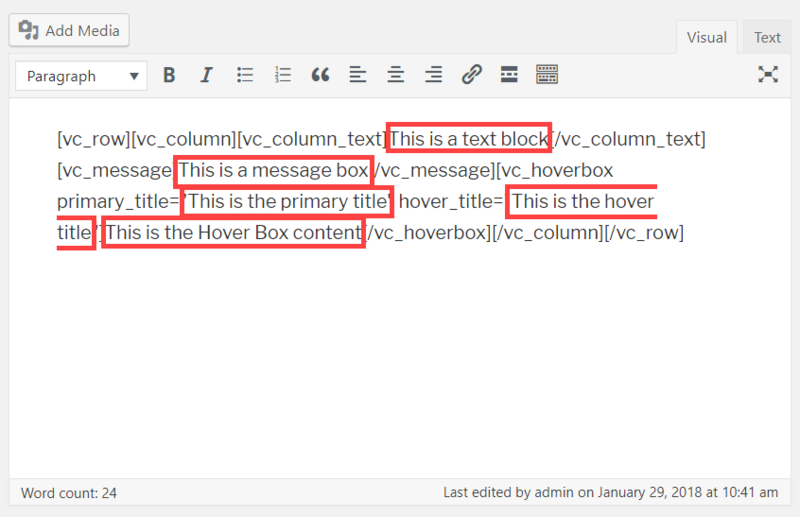 We will include a few modules, such as a Text Block, a Message Box, and a Hover Box. Our objective is to configure WPML to find the content (textual elements), such that it can display it to the user on the Translation Editor screen. 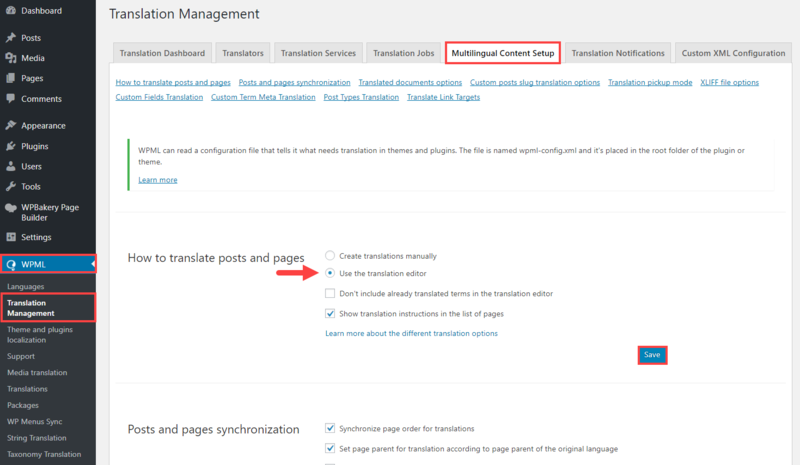 To enable the Translation Editor, go to the WPML -> Translation Management page, and click on the Multilingual Content Setup tab. 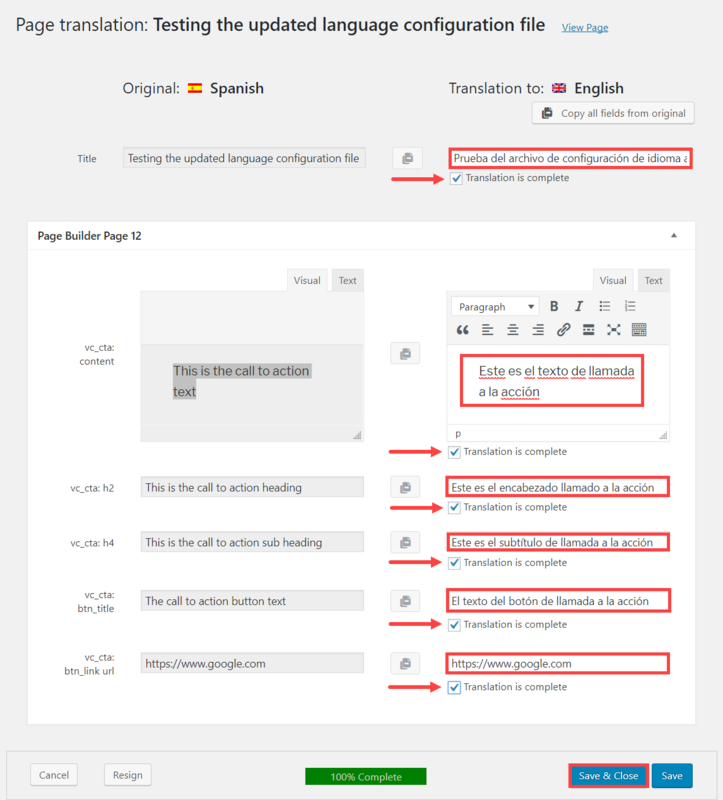 In the How to translate posts and pages section, select Use the translation editor option, and click Save. To translate the page we created, click on the “plus” icon found in the language meta-box on the top right. This will take you to the Translation Editor screen, where you can translate your page. Fill in your translated text, and choose Translation is complete for each field, then click on the Save & Close button. When we view the translated page in the Text editing mode, we can now see the translated strings wrapped with the page builder shortcodes. For the authors who are bundling a customized version of WPBakery Page Builder in their theme, please take into consideration that you will need to update the language configuration file of the customized version of the plugin. 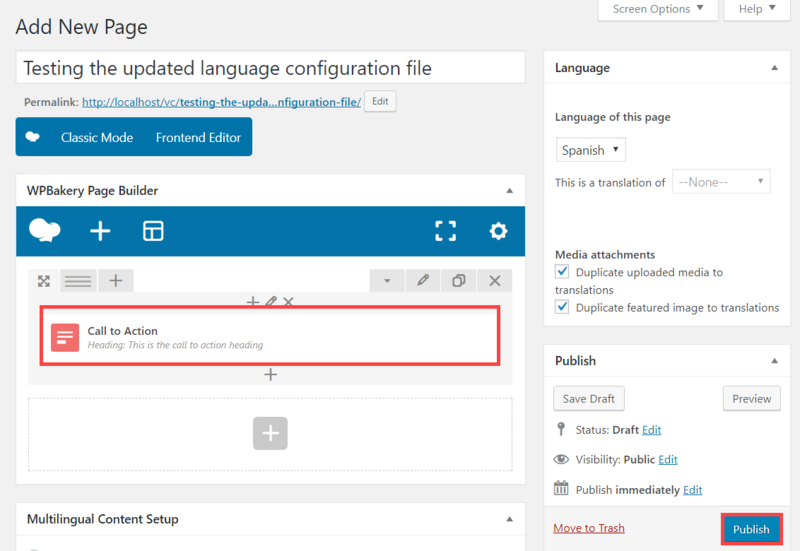 To extract strings from pages built using the WPBakery Page builder and load them on the Translation Editor screen, we need to configure WPML to identify the shortcodes and attributes containing the strings that require translation. This is done by adding a file, called wpml-config.xml, which is typically placed in the root folder of your theme. 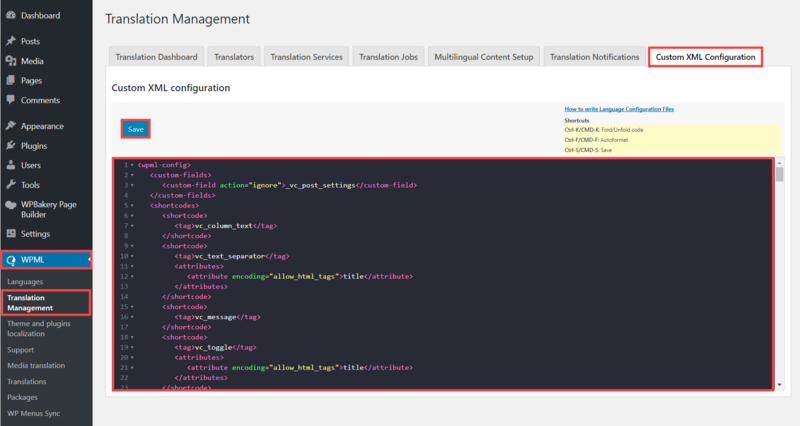 For WPBakery Page Builder, we are hosting the language configuration file on our servers. It is set to override the local configuration file placed in WPBakery’s Page Builder root folder, ensuring that the configuration file is always up to date. See our detailed documentation to learn more about the language configuration file structure and syntax. As an example, let us see how we added the Tabs shortcode to the wpml-config.xml file. The shortcode tag wraps all the tags belonging to one, single shortcode. The tag tag defines the name of the shortcode, which in this case, is the vc_tta_tabs. Set up an installation having both WPBakery Page Builder and WPML activated. Activate the String Translation, Translation Management, and Media Translation add-ons. You will need to override the remote language configuration file with the updated one. To do this, navigate to WPML -> Translation Management page, and click the Custom XML Configuration tab. Copy the content of your updated language configuration file to the editor, and click Save. Create a new page, and add the new module(s) to it. In case you updated some attributes for existing modules, add these to the page as well. 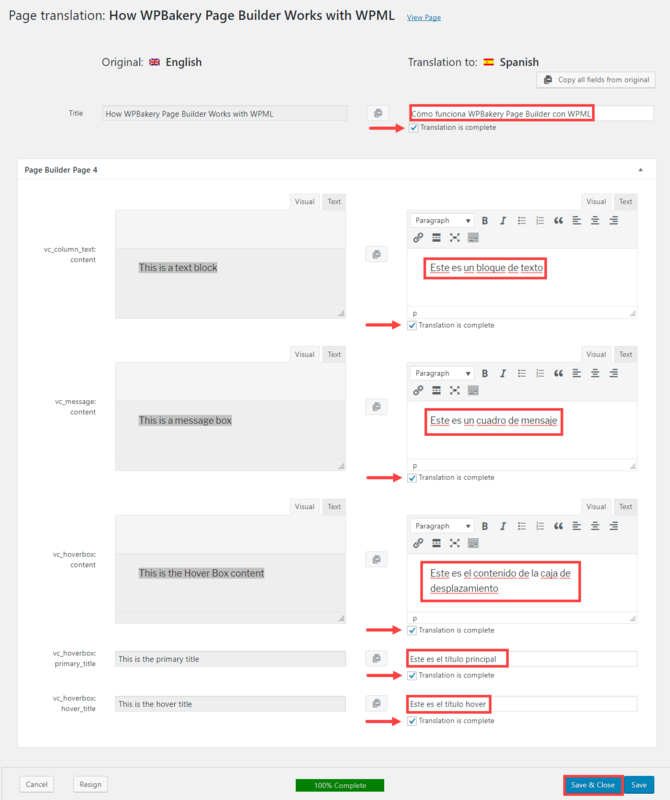 In this example, we will assume that the Call To Action module was newly added to the WPBakery Page builder. Add it to the page, and Publish. Click on the plus icon to translate the page. This will take you to the Translation Editorscreen. 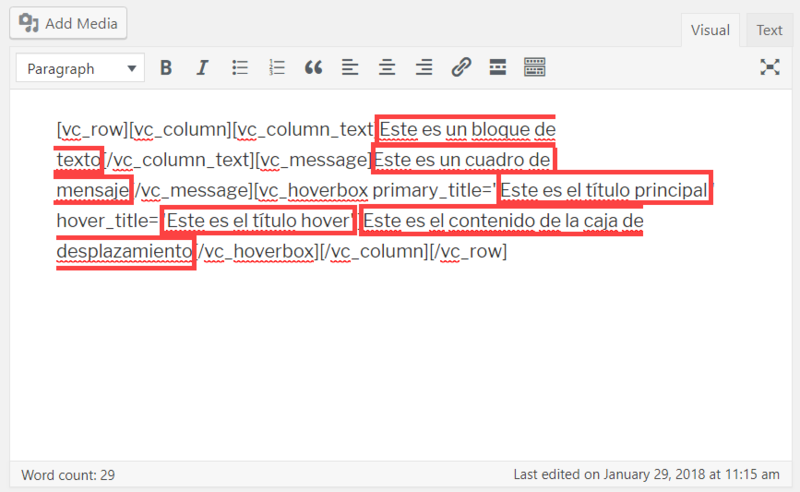 Ensure that the module textual elements are displayed on the Translation Editor screen. Fill in your translated text. Select Translation is complete for each field, then click on the Save & Close button. Check the translated page on the front-end. The translated page shows all the translated strings, implying that the updated language configuration file is working properly. In case you are encountering any issues, please contact our compatibility development team. They will be happy to check issues related to the language configuration file. Once done with the tests, please submit a merge request to our repository. Our compatibility developers will receive your requests and review it. Please note that the language configuration file hosted on our repository is for the default version of WPBakery Page Builder. In case you are updating the language configuration file of a customized version of WPBakery Page Builder, apply the changes to the configuration file inside your plugin’s root folder.